Thank you so much for peeking in today... I know that I've been really quiet lately and it's all for good reasons I promise you! I was delighted to finally get some crafty time in this weekend, as I have missed not being able to craft. I played with my zig markers and I still haven't gotten the hang of them, but I will say that I just love how bright the colors are. I tried a few different techniques on all the flowers, so if they don't all look the same that is why. Adorable tag, Calypso. Like the purple and kraft together. The "waterdrops" on the flowers looking great- makes it so real. And CONGRATS my friend ;-) way to go !!!! 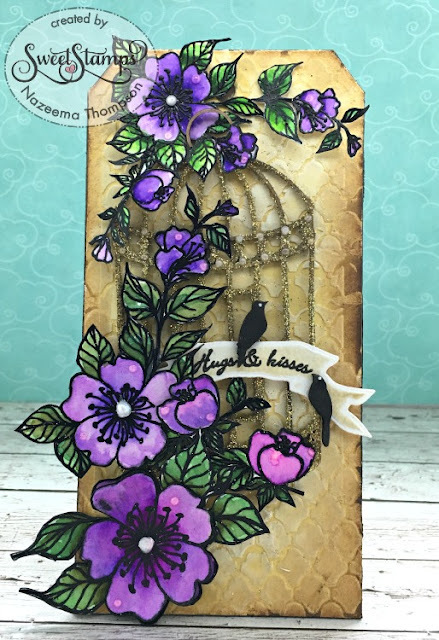 Gorgeous tag, beautifully colored flowers and I love how you layered them over the birdcage and stenciled background. Gorgeous looking tag and I really love the way your flowers pop out. Thank you for joining us at Addicted To Stamps Challengeblog. So beautiful, wonderful design and colouring of your tag.